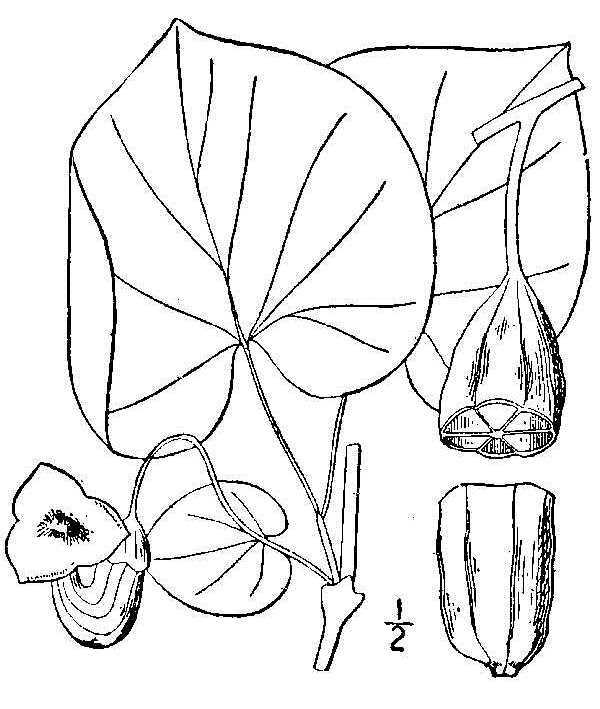 Aristolochia macrophylla. USDA-NRCS PLANTS Database / Britton, N.L., and A. Brown. 1913. An illustrated flora of the northern United States, Canada and the British Possessions. 3 vols. Charles Scribner’s Sons, New York. (Accessed 4/2014). Aristolochia macrophylla is a high-climbing, twining vine; bark with distinctive aromatic odor (scratch & sniff); new growth green in winter, older bark gray, striated with numerous elongate lenticels that merge into lines. Leaves large, heart-shaped, to 40 cm long and wide. Flowers dark purplish, irregularly tubular, bent at a sharp angle like an old-fashioned smoking-pipe, to 4 cm long, 2.5 cm wide, very broadly 3-lobed at top, lobe tips pointed. Fruit dry, cylindrical, to 8 cm long, splitting open to release numerous small seeds. Origin: Native to Appalachian mountains, from southern PA to GA. also horticultural. Habitat: Rarely escaping into disturbed woodland.